On Wednesday 17 May, John Lynch, Head Boy and Francesca Crilley, Head Girl were presented with a trophy from East Renfrewshire Council as thanks for the many contributions they have made to the school. Placements available in architecture, engineering (mainly electrical and mechanical), business, finance/accountancy. Well done to Hannah Falconer in 2a1 who has been selected to be part of the Scotland Team (part of Team GB) to compete in the International Cheer Union (ICU) World Cheerleading Championships held in Florida. We wish you all the best and are very proud of your success. Or when to rest at your Son’s feet and learn. Aspiring advocates will have a chance to see life at the Scottish bar when the Faculty of Advocates holds an Open Day for S5 and S6 school pupils and university students. The day to note is Monday 6 May, but with demand for places likely to be high, another important date is Wednesday 24 April, the deadline for applications. Gordon Jackson QC, Dean of Faculty, said: “Advocacy is an exciting and interesting profession, involving speaking up for others and defending their rights. Reminder that pupils attending the Millport Trip should arrive at the school at 9.00am with the buses departing shortly after this. Pupils should meet in the Forum where they will be registered. Congratulations to the Saint Cadoc’s Music group who received their Conveners Awards! Reminder to all pupils and parents that Friday sports club will not run today. This Sunday, th e Fourth Sunday of Lent is mid-Lent Sunday or Laetare Sunday, from the first words of the Introit Laetare Jerusalem (‘Rejoice, O Jerusalem’) from Isaiah 66:10. It’s also Mothering Sunday – and we wish all mothers a very happy day! In medieval England, today was a holiday from work when people went home to the mother church in which they were baptised. As families gathered, they gave gifts to their mothers, hence Mothering Sunday, a day we pray for our mothers too, who through their selflessness carpet their children’s lives with happiness. Please remember to say a prayer to Our Lady for your mother and grandmother. Let the example of their faith and love shine forth. Grant that we may honour them always with profound respect. 1. For our mothers, who have given us life and love, that we may show them reverence and love, we pray to the Lord. 2. For mothers who have lost a child through death, that their faith may give them hope, and their family and friends support and console them, we pray to the Lord. 3. For mothers who have died, that God may bring them into the joy of his kingdom, we pray to the Lord. Kate and Ruth (S2) had the pleasure of participating in the National Semi-final of the Crown Office and Procurator Fiscal Public Speaking Competition last night, after winning the North Strathclyde Final last month. They were runners up after an exceptional performance – well done! Congratulations go to Aidan who won the Tennis Scotland Open Tour 300 tournament at Giffnock Tennis Club! Congratulation go to S1 Gymnast of the Year Dominic and S1 Dancer of the Year Eva. Hannah and Kate competed for Scotland in the International School’s Cross Country in Dublin on Saturday. Hannah came 9th and Kate 20th. The Scottish team won team silver. Thank you to everyone for coming along to our annual life afternoon tea on Saturday. It was a great success and everyone enjoyed an afternoon of great music, tea, coffee, and home baking. We raised over £1000 for the life group charities! Thank you so much to everyone who came along to The Big Quiz Night on Friday to raise money to put an end to human trafficking! We raised an amazing £399 thanks to your support! Here are the answers to the quiz for anyone who is interested. The Spring Concert will take place on Thursday 28th at 7pm. Come along to our Spring Concert featuring the huge array of talent covering classical and popular music and song. Mass at 8.25am. Solemnity of the Annunciation (Lady Day). Meeting of the Wednesday Breakfast Prayer Group and Catholic Leadership Group,3.30pm, Oratory. Refreshments afterwards in the staffroom. Eucharistic Adoration with Stations of the Cross, 12.20pm. Follow this link to view the photographs from tonight’s Fashion Show and Art and Design Exhibition. 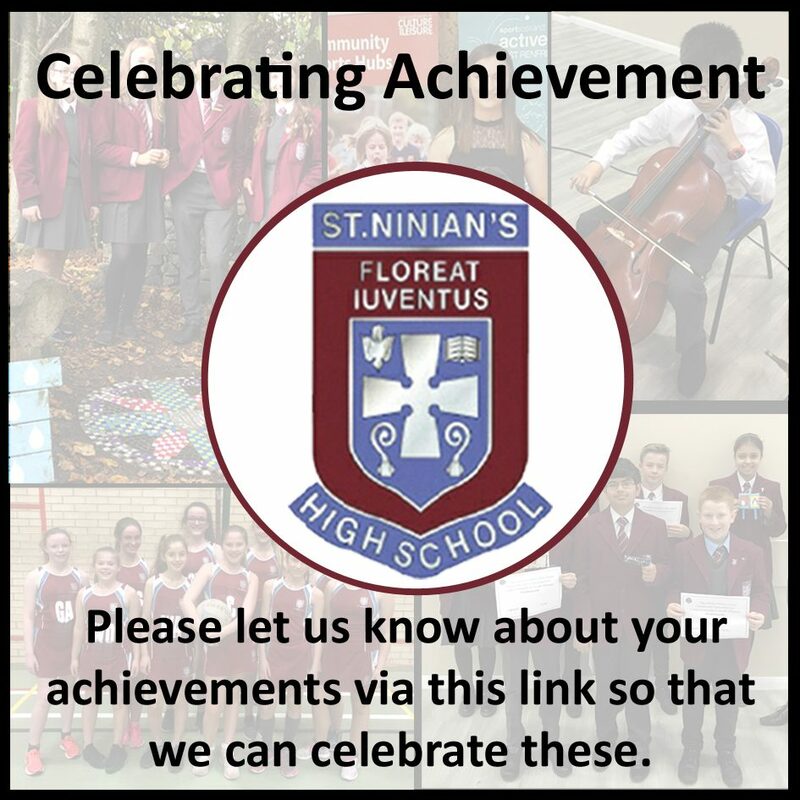 Well done to all the pupils and staff members involved, and a huge congratulations to the Creative Industries classes for all their hard work! We are delighted to inform you that once again St Ninian’s High School will be offering an Easter School programme of revision classes during this year’s Easter Break. Classes in subjects will be offered for aduration of 3 hours in either the morning or afternoon, the aim being to provide young people with the opportunity to receive extended support and tuition from our staff. In order to operate this programme the school requires to charge pupils a flat rate per day for the programme. This payment entitles pupils to register for both sessions (a.m. and p.m.) offered during that particular day. The cost for this year’s programme has been set at £13.50 per day. Traditionally we have offered classes over both weeks of the programme to allow our pupils to access the fullrange of subjects. Whilst we acknowledge the commitment of pupils and staff to Easter School, we also appreciate the need for rest, and therefore classes will run for four days in Week 1 (1st to 4th April), and four days in Week 2 (8th to 11th April). Payment should be made in advance using the on-line payments facility –ParentPay – details of which can be found below. Please also note that pupils who have an entitlement to Free School Meals will continue to access Easter School free of charge. S2 Computing Science classes recently took part in the Global Game Jam competition to design and create a computer game in a day. A winning entry was chosen in each class. Here is the winning team from 2F1 ‘The Shadow Kings’ who won with their excellent game ‘Lost in the Past’. Congratulations Catherine King 1a5 who was part of the Intermediate Choir that won at the Glasgow Music Festival! Hopefully, we are making good efforts in the traditional practices of Lent : Prayer, Almsgiving and Fasting. Today we are thinking about fasting and sacrifice when we give up something we like or do something extra. In this way we build up our self-control which helps us resist the temptation of sin. Dear Lord, give me the strength and will-power to fight sin and not fall victim to temptation. Give me the courage to forgive others who do wrong to me. Help me to cope with the challenges of life in faith and trust of you. Show me what it means to love so I may best spread your word. Also, Paul Docherty (6a10) won the Concerto Class putting him through to the Premier Award Class on Friday 15 March 2019. Come and meet us + see our students perform at Can You Dance, SEC Glasgow. Get a taste of the diversity of training in our annual college performance. NEW! Free download: AuditionTips + Checklist! 🌟 Interested in DFA College? We’re very proud of our high graduate employment rate – get the full course details. The Big Quiz Night hosted by the No Child Taken group will take place next Friday 22nd March! It would be great to see as many people as possible supporting this great cause. The group have been working hard to put on a great night and we wouldn’t want you to miss it. This evening is a celebration of some of the achievements our artists have made this year. The display boards are decorated with vibrant inspiring artworks from our young people. They have been called upon to use a wide variety of mediums to produce a diverse and unique range of work which is both aesthetically and intelligently considered, and is infused with contemporary flare which challenges your traditional perceptions of art. The student-led fashion show will showcase the talents of our wonderful students from Art coordinated by students studying Creative Industries. The students have created some stunning outfits using re-cycled textiles, paper and card. Dance and Gymnastics Show, 20th March, 7pm, Atrium. Dance is becoming an increasingly popular subject choice with courses now being offered in NPA, N5, and Higher. Many students are now creating and performing some beautiful examination material which often goes unseen other than in closed exams. The dancers and gymnasts would love to share their wide range of work with staff, friends and family It is sure to be an evening of beautiful, dramatic, technically strong and creative dance, so please do come along and support then in their efforts. The Annual St Joseph’s Day Breakfast to mark the Solemnity of St Joseph will take place at 8.am on Tuesday 19 March in School. At 8am, the prayer of St Joseph will be said and Monsignor Monaghan will give a short input on the theme of ‘The Table of St Joseph and the Dignity of Work’. After a short time for discussion we will celebrate the Mass of St Joseph and 8.25am followed by breakfast for parents and some students. The Table of St Joseph is a Sicilian Tradition to mark the Solemnity bringing people together in friendship and concern for the poor. The tradition invites people to bring with them a donation of perhaps cash, though more traditionally food, which placed on the Table of St Joseph, would then be distributed to the needy. On Tuesday, we invite people to join in this tradition and any gifts will be distributed by the local Saint Vincent de Paul Society. St Joseph Day Reflection, RE Room 2, 8am. With Monsignor Monaghan on the theme of ‘The Table of St Joseph and the Dignity of Work’. Saturday: Life Afternoon Tea, 1-4pm. Mass for Caritas pupils, St Joseph’s Church, 5pm.